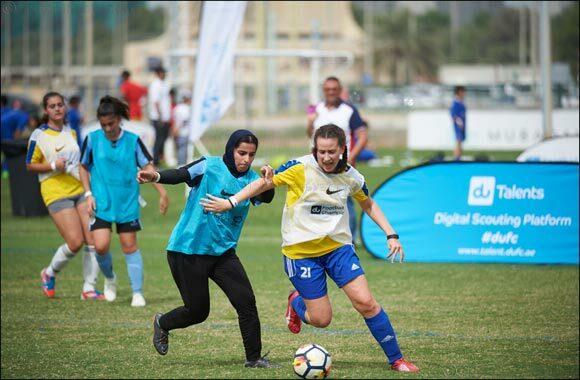 Abu Dhabi, UAE, 19 Nov 2018 – This weekend saw the second day of group stage matches in Abu Dhabi and Al Ain of the duFC, the only international scouting platform in partnership with LaLiga and home of the official UAE Schools and Streets Cups and UAE Girls Challenge. This year a record number of girls’ teams participated, one third of which are government school teams. Charging into week two’s competition, the girls from British School Al Khubairat (BSAK) continued their school’s winning streak, thrashing their way to the top of their group, while Um Al Emirate Government school surprised everyone with all wins. The knockout round of the Abu Dhabi Leg of the UAE Girls Challenge will be a heated competition worth watching. In the Schools Cup Boys U16 Emirates National School surprised former duFC strong boys, International Community School, with a fast pace game ending 3-1 and going home at the top of their group. “This is an excellent tournament with lots of participants. It’s great to see so many people out supporting the players too,” said Mrs. Farida from Emirates Private School. In other games, Al Manhal International Private School boys U16 won 3 straight games. In Al Ain, Gracevalley Indian School squeezed past favorites Al Dhafra Private School to the top of Group A. In the Streets Cup Boys U14 FC Shadow Blazers blazed through all of their matches with a 14-point goal difference. In the Streets Cup Boys, U16 Undefeatable Squad lived up to its name taking all three games and leading its group, securing a place in the knockout round. Bani Yas, down one player in their final game, also secured a place in the knockout round with a 9-0 win over Nine Street. du Talents is the Middle East’s first digital scouting platform where players can build their online profile and be seen by our scouts. Challenges posted on the platform gives players the chance to win cool prizes while honing specific skills designed by LaLiga scouts to test the players. du Talents launched this month and already has over 1000 members. In the end, it has been another week of promising football excellence at the duFC, with more to come in the following weeks.